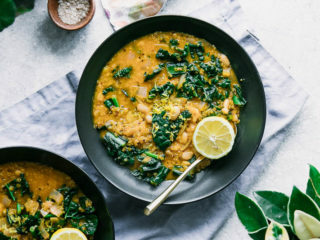 White Bean Kale Quinoa Soup, a simple one-pot plant-based soup made with cannellini bean, quinoa, kale, and lemon that comes together under 40 minutes. A perfect freezer-friendly meal prep recipe! In a large soup pot over medium heat, saute onion and garlic with olive oil and oregano until soft, about 4-5 minutes. Add drained white beans, quinoa, and vegetable broth and increase heat to bring to a boil, then reduce heat to a low simmer and cook covered for 20 minutes. After soup has cooked and has thickened, add kale, lemon juice and lemon zest, and salt and pepper to taste. Let cook 2-3 minutes more so kale softens, then remove from heat and serve with sprinkled lemon zest. Leftovers and storage: store soup in glass storage containers in the refrigerator for up to five days, and in the freezer for up to one month. To reheat bring soup to a boil in a pot and season as needed. Nutrition notes: this White Bean Kale Quinoa Soup is high in plant-based protein, fiber, potassium, vitamin C, and vitamin A.